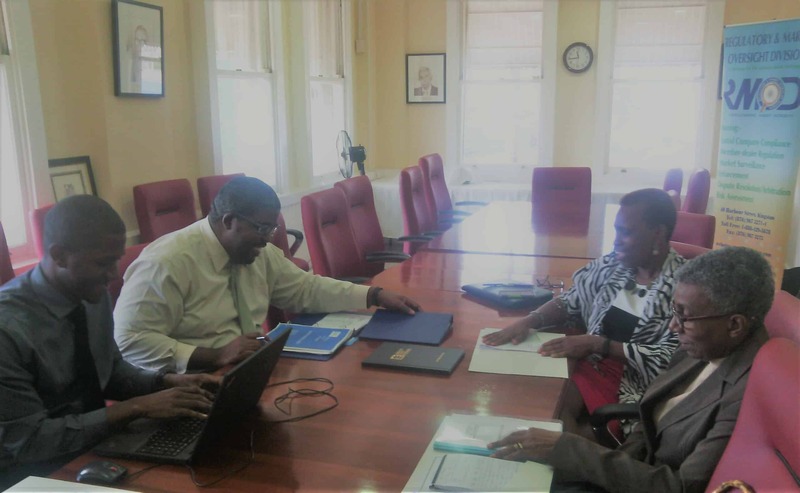 The Regulatory and Market Oversight Division’s (RMOD) Acting Chief Regulatory Officer, Mr. Andrae Tulloch (second left) and Market Surveillance and Compliance Officer, Mr. Reynard Whyte (left) conducts JSE Rules orientation Session with GWest Corporation Limited’s (GWEST) Corporate Secretary, Ms. Merl Dundas (second right) and Director, Mrs. Elva Williams-Richards (right). Also in attendance via telephone are GWEST’s Managing Director, Mr. Richard Barrows and Chief Accountant, Ms. Camille Adrians. The session was held on Wednesday January 31, 2018 at the Jamaica Stock Exchange.